Snake finally sneaks his way onto Steam – but what does that mean for PC gamers? Metal Gear Solid is known for a lot of things: tense (if unrealistic) stealth gameplay, lengthy cinematic cutscenes, some of the earliest known examples of “voice acting that isn’t atrocious” in video games, and a cartoonishly complicated generational soap opera plot that blends the most awesomely ludicrous parts of anime, 80’s action movies, and Tom Clancy-style speculative military fiction. All of this totally rules. But you know what it isn’t known for? A strong presence on PCs. That doesn’t rule. 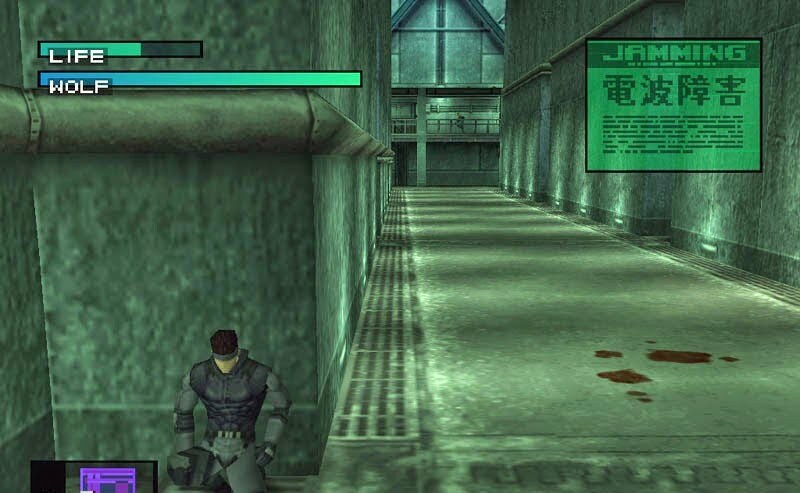 It isn’t completely missing from Windows; a well-received up-rezzed port of the original Metal Gear Solid landed a few years after its PlaSstation release, and a not-as-good port of the sequel Metal Gear Solid 2 was soon to follow. (Anecdotally, I remember a listing for a PC port of Metal Gear Solid 3 being listed in the computers of the EB Games I was working at at the time, only for the SKU to quietly vanish shortly after release of the console version). But since then, the Metal Gear series has kept its unique brand of box-crawling, ration-eating, tranq-darting fun mostly to consoles – and a TON of pretty damn good handheld games, giving Castlevania a run for the “best console orphan who moved to handheld really successfully” title. The Windows 98 port of Metal Gear Solid was so great I lied to my parents about it being a different game so they’d buy it for me twice. Until NOW, that is! To the surprise of basically everyone other than employees of Konami, it was announced that both Metal Gear Solid V: The Phantom Pain and its weird oversized-demo predecessor Metal Gear Solid: Ground Zeroes were coming to Steam, despite the fact that if you had been a PC-only gamer within the last ten years you missed out on at least three major releases in the series. But no matter! It’s here now, and that’s what counts! So is Ground Zeroes on PC any good? As a game, yes, but that isn’t what I’m here to discuss. 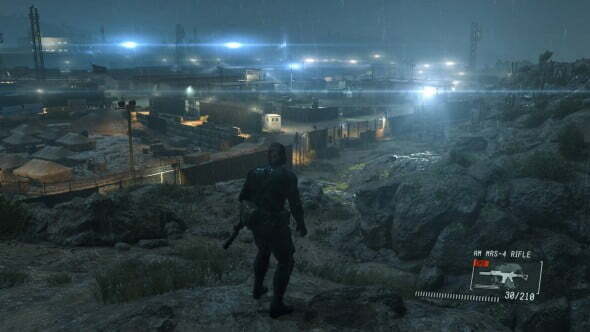 Much has been written about its merits as an appetizer for The Phantom Pain and its quality as a standalone title – in fact, this very site had some mighty fine words about it if you’re looking for more information. What I’d like to discuss today is how it handled the often-troubling transition to computers. Sure, a rainy island at night maybe isn’t the best place to show off your computer’s horsepower, but I promise you this game is gorgeous. The thing I tend to look at most in console-to-PC-translations (or vice versa) is the gameplay itself. Often enough a game beginning life on one platform will have things added or removed en route to a different format, be it menus and control schemes to whole gameplay scenarios – this may sound pretty obvious to some of you but I find it worth mentioning. In this regard, Ground Zeroes makes it out…basically unscathed, basically. In the interest of getting the full PC experience, I played my first playthrough using mouse+keyboard just like my dad would want me to and it was basically functional…basically. Mouselook fits the open-world third-person stylings of MGS very well, allowing me much faster reaction times and better accuracy in combat, as well as affording me a much better view of the world as a whole. The default keyboard settings were…a bit of a different story. Much of Ground Zeroes requires multiple inputs, such as holding down a few different buttons to select options while interrogating an enemy soldier. Default bindings made this a bit trickier proposition than it should have been – and while the keys are remappable, the problem remains that you still have to hold like two-three buttons depending on certain actions you want to perform, and it’s weird! Contextual commands didn’t seem as responsive as I remember the PS3 version being, but that may be due in part to how my brain evidently can’t distinguish between the “R” and “E” keys at times, so we could chalk this up to user error. Important things like sticking to cover and crouching work exactly as they’re supposed to, so really the only control issues lie on the periphery of the experience. Menus are a bit weird too – default settings means you switch between menus with 1 and 3, and while you can’t use the mouse to navigate them, you can select things by clicking the mouse button, which I did a ton of times totally by accident. Again, user error, but worth mentioning that anyone with any level of PC-game-control conditioning might have a bit of an adjustment period. 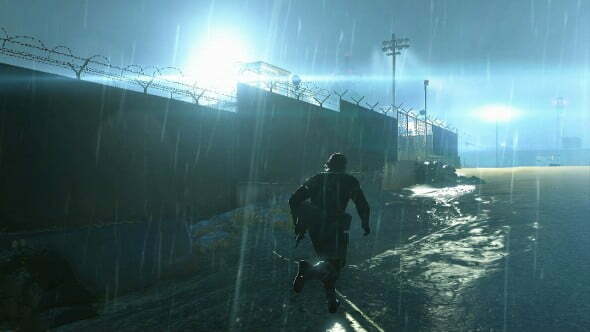 I feel like “running away from spotlights outside a shady government prison camp” is a pretty universal video game concept, no matter the platform or genre. Technologically, though, it holds up very well. Maybe I’m just bitter, but I was surprised at the amount of graphical choices it offered – shadow detailing, texture detail, and the like are all changeable, and there’s a good amount of resolutions to pick from. I don’t have the system specs nearby me to check, but everything was defaulted to High for me and moving everything up to Extra High resulted in the tiniest framerate drop. It still looks amazing one way or another and is a noticeable increase from the PS3 port I’d tried previously – the textures are vastly improved, the lighting never fails to impress, and the models just seem more…alive and detailed. Really, it’s just good to see Konami putting the effort in to give PC gamers that sort of control over the experience, as opposed to some other recent console-to-PC ports (~cough~ Valkyria Chronicles even though it’s still amazing ~cough~). Okay, so it plays pretty well and runs awesomely. Here’s the clincher – after so long away, should PC gamers give a crap that Snake came back to play? That really depends. I, for one, think it’s a great fit – open-world games have always been a big hit on PC and given that the underlying concepts of the game aren’t too wildly removed from computer stalwarts like Splinter Cell and FarCry, I could see people unfamiliar with Snake’s previous exploits enjoying themselves. And maybe this isn’t hard and fast evidence, but almost everyone I know with a PC these days has at least spent enough time with systems and handhelds that the name Metal Gear isn’t a total unknown – and I’m sure that’s the case for a lot of other people. Konami, the publisher of Metal Gear, has made efforts to reach out to PC gamers before – take a look at their decent-sized list of PC games back in the PS2 era for proof that they at least tried. WHY Konami decided to get back into it now, and not after, say…Metal Gear Solid 4 – or why they even bothered, really – is unknown to all, but frankly I’m glad it happened. I can’t possibly be the only person out there who is using this as an excuse to not buy a next-gen system. And if you’ve never played a Metal Gear game, or at least not since the Playstation (or even NES) days, then I think you’ll find something to like – only if you don’t mind insane plots, perfectly hammy voice acting, and hiding behind crates and doorways for enemies to walk past. Wait, what am I saying? 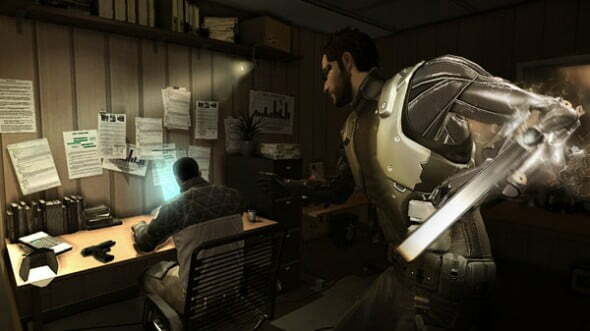 PC gamers LOVE Deus Ex! You’ll love Ground Zeroes too, I can almost promise it. Gruff-voiced man with beard stealth-kills his way to the truth behind a nearly-ancient conspiracy – wait oh god what game am I describing? !